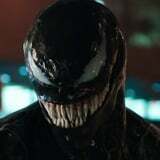 If you had any doubts about Tom Hardy's upcoming Spider-Man spinoff, Venom, hopefully the film's new trailer will put your anxieties at ease. In it, we get the first glimpse of Tom Hardy as Venom in all his terrifying, gory glory. The trailer also gives insight into Eddie Brock's (Hardy) transition and struggle going from investigative journalist to Symobiote host, finally referring to himself "we." (Shiver!) We also meet ex-girlfriend Anne Weying (Michelle Williams) and Riz Ahmed's evil Dr. Carlton Drake (who will later become the film's main antagonist, a fellow symbiote called Riot). Since the movie is a Marvel property, there's the potential for Tom Holland's Peter Parker to make an appearance down the line, so we can't wait to see how that comes together. Watch the trailer above before Venom hits theaters on Oct. 5.